The 1984 study by Norbiato et al. is not a very recent, but it's probably a very important study which was set up to investigate "the role of potassium deficiency in the development of glucose intolerance during caloric deprivation" (Norbiato. 1984). Or, put simly, the scientists wanted to know if a low potassium level may promote insulin resistance and modify or is modified in response to dieting (in this case protein-modified fasting). In the study, two groups of subjects were studied. The "normal" group consisted of ten subjects, who were 27-45 years old and whose body weights ranged from 89 to 115% of the "ideal body weight". The "obese" group group consisted of twenty subjects aged 21-48 years who were 70%-131% overweight. Before the obese subjects were put on a protein modified fast (PMF) all subjects, lean or obese, received a "weight-maintaining diet" with 200g/day carbohydrates for 8 days. 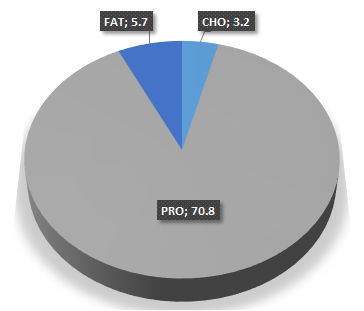 Figure 1: Macronutrient composition of the ~380kcal PMF diet (Norbiato. 1984). [...] Calculated protein intakes, according to standard tables, were 70.8+/-7.6 g/day (about 79% of calories). Calculated fat intake was 5.7+/-3.5 g /day (19% of calories). Carbohydrate contributed 3.2+/-1.3 g/day, 2% of caloric input" (Norbiato. 1984). 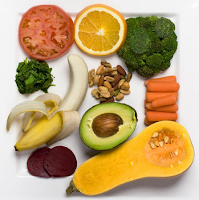 As far as its potassium content is concerned the PMF diet was (as probably most diets that are almost exclusively protein) on the skinny side (15 +/- 3.9 mmol of potassium/day | adult men and women should get 100mmol/day and 72mmol/day, that's 3,800mg and 2,800mg/day or 8-9 bananas if you want to "go bananas" instead of leafy greens ;-). Nevertheless, only 10 out of 20 of the obese subjects received an oral potassium chloride (64 mmol/day) supplement (KC1-retard, Zyma, Italy). The other ten patients received identical placebo tablets. 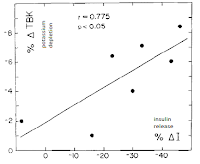 Relation between percent change in total body potassium (%ATBK) as a result of potassium depletion protocol and the corresponding percent change in serum insulin response (%A I)to steady state hyperglycemia (Rowe. 1998). Why does potassium affect glucose metabolism, anyway? The impaired ability to handle dietary glucose in potassium deficient individuals is a results of (a) an impaired insulin secretion (main factor) and (b) a reduced peripheral insulin sensitivity (probably less important | Rowe. 1989). 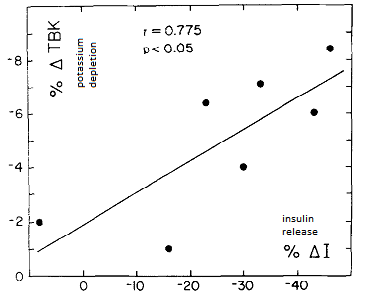 As the figure on the left hand side of this box shows, the association between potassium depletion and the reduction in insulin secretion is almost linear (Rowe. 1989) - in other words: The lower your potassium, the less insulin you produce and (in conjunction with the reduced peripheral glucose uptake) the higher your glucose levels will rise. Interestingly, the potassium levels dropped in both groups during fasting. More importantly, though, the decrease in potassium was associated with a sign. reduction in peripheral levels of insulin along with an increase in insulin receptors and a striking reduction of peripheral glucose utilization in the obese subjects on their protein modified fast. 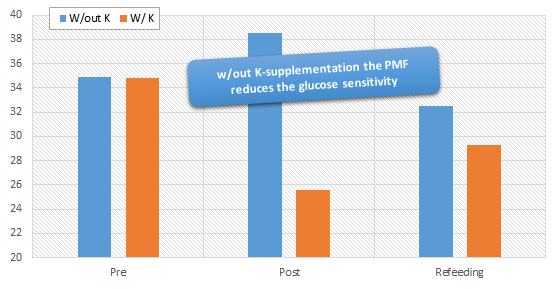 Figure 2: Mean integrated area under the glucose tolerance test curve in obese subjects submitted to protein-modified fast (PMF) with or without oral KCl supplementation (K): studies were performed in the control period after a 14-day fast and after after 10 days of refeeding with a diet containing 700 kcal (45% carbohydrate) per day (Norbiato. 1984). Increase in insulin receptor binding and impaired glucose management? How does this go together? Well, if the receptor does not respond, it is no wonder that the researchers found that their subjects ability to handle glucose was significantly impaired in the euglycaemic clamp study. 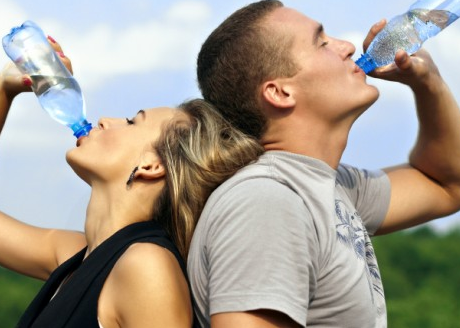 The fact that many Americans don't get enough of the "non-salt" electrolytes (calcium, magnesium, potassium) is also due to the fact that mineral water is still an exotic beverage in the US | learn more. So what? You better watch your potassium intake when you're dieting? Well, that's the most obvious conclusion you can draw, but eventually the results of a study at hand area a warning for everyone not to forget to monitor his / her potassium intake. Patients / people with diarrhea, kidney disorder, diabetes, or primary aldosteronism and everyone who (ab-)uses alcohol, laxatives, or certain anti-biotics may be at highest risk of developing low potassium levels. As you know from my previous article on common nutrient deficiencies (read it! ), you don't necessarily have to belong to any of the aforementioned groups to be on the low side with regards to your potassium intake and/or on the high side with respect to your potassium loss - ah, and did I mention that high protein diets are not exactly potassium-heavy, ... ya, I think I did ;-) | Comment on Facebook! Norbiato, Guido, et al. "Effects of potassium supplementation on insulin binding and insulin action in human obesity: protein‐modified fast and refeeding." 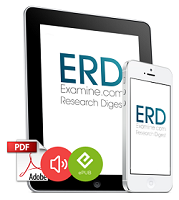 European journal of clinical investigation 14.6 (1984): 414-419. Rowe, John W., et al. "Effect of experimental potassium deficiency on glucose and insulin metabolism." Metabolism 29.6 (1980): 498-502.